Lime scale can build up on the inside of your aquarium's glass, causing the finest setup to appear unsightly. Lime scale forms when water evaporates, leaving minerals adhered to the glass. In a bathtub or sink, chemical cleaners can serve to remove lime scale, but these are toxic to fish and should never be used in aquariums. A scraper may remove some lime scale; white vinegar can do the rest. 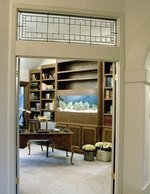 Remove fish from the aquarium and place them in a prepared temporary holding tank. Empty the water from the aquarium. Lay out a towel on a flat surface. Add a small amount of white vinegar to a spray bottle that has never been used for other cleaning products. Place the aquarium on its side, and spray the lime scale deposits with the vinegar. Allow this to set for a few minutes. Wipe the lime scale away using a soft cloth. Scrape any remaining lime scale from the aquarium wall using a pot scraper. Keep this pot scraper separate for aquarium use only. Repeat steps 5, 6 and 7 until you have removed all of the lime scale.